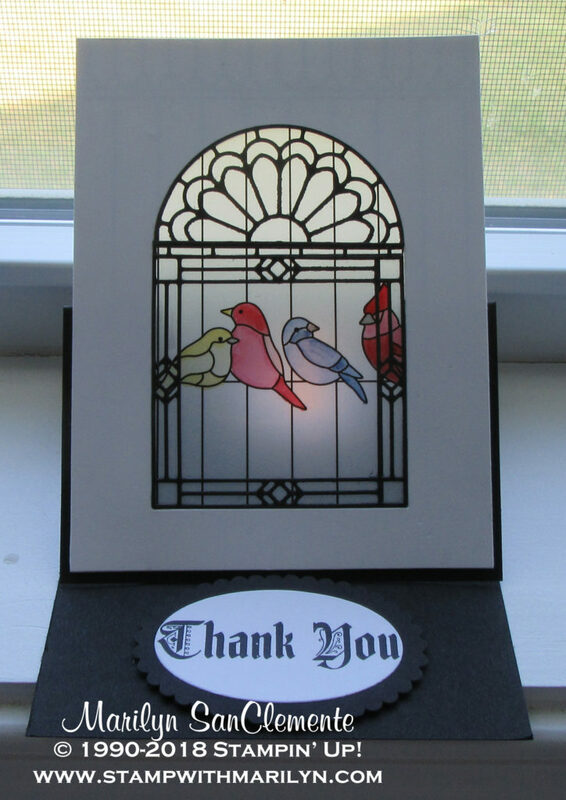 Today I am sharing a handmade Graceful Glass Card that one of my downline made today! I just love the look of the new Stampin’ Up! Graceful Glass suite with the Designer Vellum and the Painted Glass stamp set. This set is absolutely beautiful! Today one of my downlines, Ruth Tinkham, said she wanted to try an Easel card and had this idea in her head. I am planning on using the Graceful Glass vellum for my Stamp Club class next week; so I was excited when she started working on her idea! Card base: Basic Black cardstock cut to 4 1/4″ x 11″. Scored at 2 3/4″ and 5 1/2″. Line up the two whisper white pieces (do not glue them together yet) and use the half circle die from the Painted Glass dies to cut the rounded top of the window for the card. Line up the 2 1/2″ square die to cut out the area below the half circle. Make sure the pieces are in the center of the white pieces. This will give you the opening for the stained glass window. Line up one piece of whisper white onto the front half of the basic black card base (the side that has the fold). Cut the window out again to make the window on the basic black card base. Choose the section of the patterned Graceful Glass vellum that you want to appear in the window. Cut around that section so you have a 3 1/2″ x 4 1/2″ piece. Use the Blends markers to color the birds on the stained glass window. Attach one piece of the whisper white cardstock to the front of the card. Make sure that the windows line up. Attach the colored vellum piece over the whisper white cardstock making sure the portion that you want to see shows through the window. Line up the second piece of Whisper White cardstock over the window and attach to hide the vellum. You should only see the design that you want through the window. Use the 2 1/2″ square die and the half circle die with Basic Black cardstock to cut out the pieces for the stained glass window. Use the Fine Tip Glue pen to outline the black outline of the window. Lay over the vellum. Set aside to dry. Stamp the sentiment “Thank You” with Black ink on a scrap of Whisper White cardstock. Cu t out with the layering oval die. Cut a coordinating scalloped oval from a scrap of Basic Black cardstock. Attach to the inside of the card near the bottom with dimensionals. This will become the stand to hold the card open. 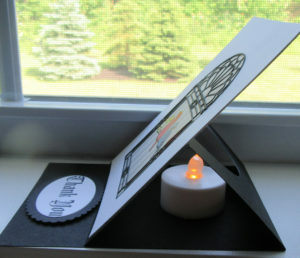 Slide a battery operated candle in the center of the card and turn on!